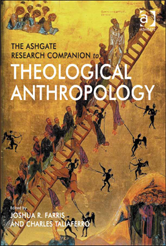 The Ashgate Research Companion to Theological Anthropology is a resource for philosophers and theologians, students and scholars, interested in the constructive, critical exploration of a theology of human persons. 9 Anthropological Hylomorphism - Bruno Niederbacher, S.J. 15 The Dual-Functionality of the Imago Dei as Human Flourishing in the Church Fathers - Fr. David Vincent Meconi, S.J. 16 Ecclesial-Narratival Model of the Imago Dei - Dominic Robinson, S.J.